A weekend trip to Northern California gave me a chance to do a bit of beer prospecting. I almost felt like a 49er from the gold rush era. Almost. This was my second trip down there in just over a year. 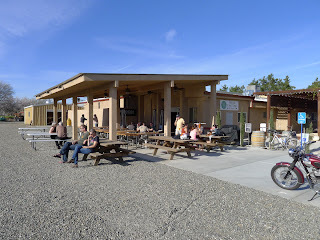 Previously, I visited Russian River, Bear Republic and Lagunitas. 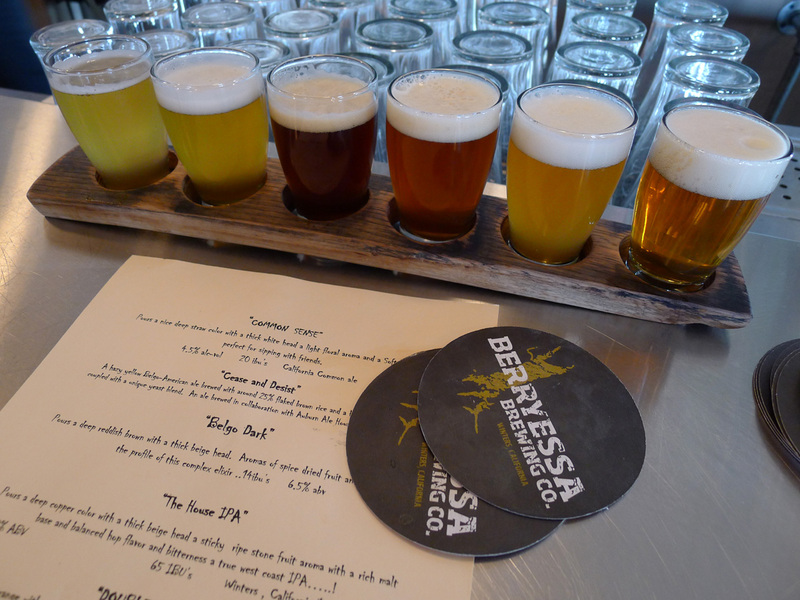 This time, Berryessa Brewing. A few basic details. Berryessa is located on the outskirts of Winters, Calif. As the crow flies, Winters is about 30 miles west of Sacramento and some 65 miles northeast of San Francisco. If you're wondering, the brewery takes its name from nearby Lake Berryessa...and a rendering of the lake is part of their branding. Wine snobs will note that the wine-rich Napa Valley is a mountain range to the west of Winters. What you'll mostly find growing in the rich farmland surrounding Winters is nuts...almond and walnut trees dominate the scenery. Winters is a bedroom community of roughly 6,500. The largest employer here is a nut packing firm. Next in line is the school district. Many who live here don't work here. Instead, they drive to the Bay Area or to Sacramento or Davis (home of University of California at Davis and 15 miles to the east). The weather here is hot as hell in the summer, moderate and typically wet in the winter. There's a reason why this stuff is important and I'll get to it. 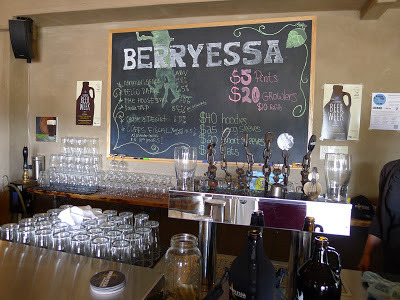 Berryessa Brewing is the brainchild of Chris Miller, a well-known and respected brewer who was previously Brewmaster at Snipes Mountain Brewing in Sunnyside, Wash. Miller is fairly well-known in Portland beer circles for his ability to conjure up uniquely pleasing beers with Yakima hops...something he continues to do in his new gig. 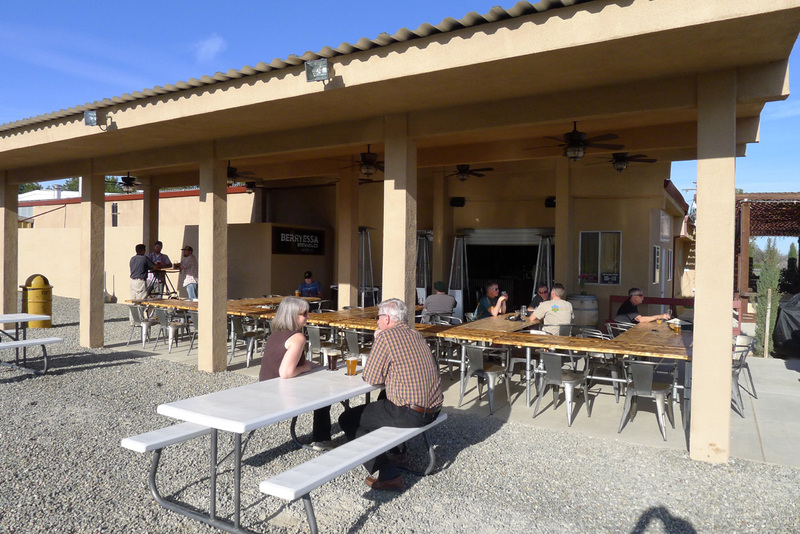 The brewery itself is a 15 bbl system located in a building that previously housed Berryessa Gap Winery. The winery got too big for the space and moved, although they still have a tasting room in the building. Miller has previously talked about tapping into the wine barrel connection to produce barrel-aged beers and he's done some of that. On my visit, there were no barrel-aged brews on the menu. Unfortunately. There were six beers on the board when I stopped in. I cannot say I loved each of these beers, but most of them were pretty good and at least two of them are excellent and would be well-received almost anywhere. Common Sense Ale is exactly what the name implies: a common sense beer you can quaff with friends for hours. The beer is light in color with a pleasant floral aroma on a mellow malt backbone. This is an easy-drinking, refreshing beer. It's rated at 4.5% ABV and 20 IBU. My recent quest for tasty session beers was perfectly satisfied by Common Sense. Double Tap IPA is an aromatic hop bomb and Berryessa's most popular beer for reasons that become instantly clear. It's dusty pale in color clocks in at 8.5% and 70 IBU, but this beer isn't remotely bitter. It relies on a sticky tropical aroma and flavor and a solid malt backdrop. On an IPA map, Double Tap would appear roughly halfway between Boneyard RPM and Hop Venom. 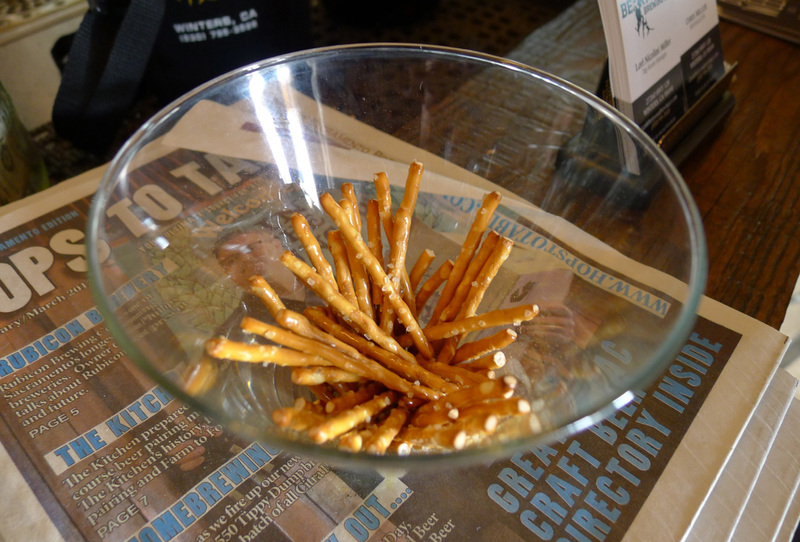 Dry-hopping is the key to this ingenious beer, as is the case with its Boneyard brethren. People were showing up in droves to get growler fills of Double Tap...which weren't available this day due to an impending weekend event and a short supply. Too bad. On the flip side of the IPA game, they have House IPA. The ratings wheel says 6.5% ABV and 65 IBU. 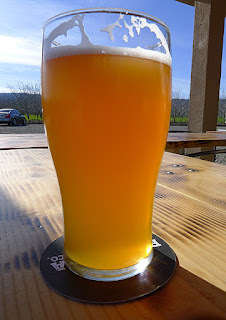 While Double Tap has much in common with Oregon IPAs, the House IPA is more reminiscent of what you typically find in California. It is deep copper in color and fairly bitter. Hop aroma and flavor are subdued. I did not particularly care for this beer, but perhaps I would have if I hadn't been tasting Double Tap at the same time. You might well wonder how a town of Winters' size can be expected to support a brewery. Let it be known that Winters and Sunnyside have a lot in common. Both are rural and both are located in the middle of heavy agriculture. Both are hot and dry in the summer. As it turns out, Sunnyside is nearly three times as large (population) as Winters. But never mind. The community of Winters won't have to support this brewery on its own. Why? First, Miller has built a name and is distributing beyond Winters. There's no word on when bottling might enter the picture, but it may happen someday. Second, Winters is becoming a destination. Residents of the Bay Area, Sacramento and elsewhere are beginning to visit or stop by to enjoy the weather, the small town charm and the artisan businesses. Winters has been mostly a well-kept secret until recently, but its status as a destination is gaining momentum and will accelerate as more lodging is built...and reliable sources tell me new hotels are coming. One thing they do need to address here is food. The short of the operation is that pretzels are all they have to munch on. If this were Portland, there would be a food cart (or carts) selling sandwiches, burritos or teriyaki chicken bento in the parking lot. Obviously, that isn't the case. This place appears to be doing fine, but having food on premise or nearby would be a nice addition. 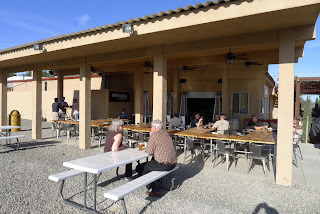 If you're in the neighborhood, Berryessa Brewing is worth a visit. 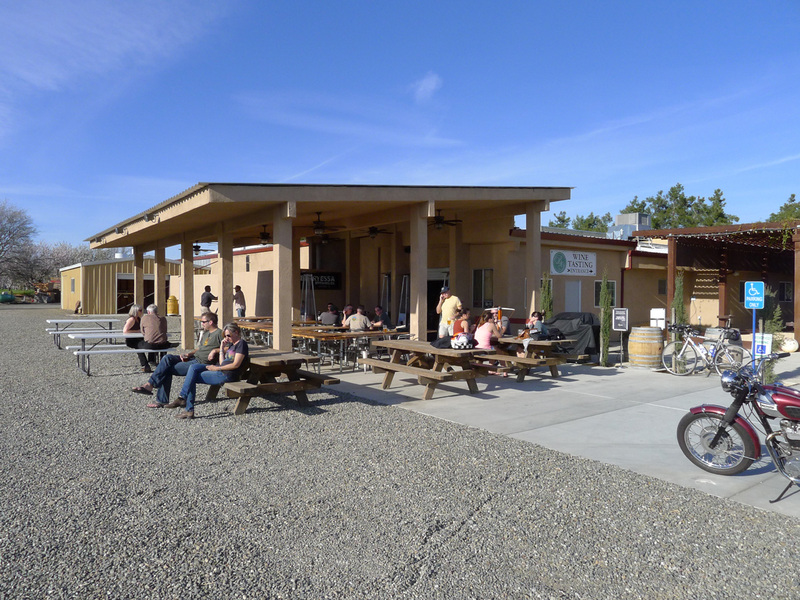 The tasting room is only open Friday-Sunday (the hours are posted on their website), so plan your trip accordingly.